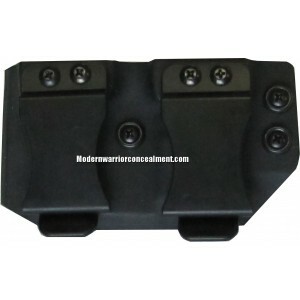 Modern Warrior Concealments double magazine carriers are the best on the market. Not only are they streamlined but they look great too. No more of the bulky kydex taking up too much real-estate along your waistline. One thing that separates our magazine carriers from most others is that they are universal. You can use them for IWB or OWB and you can switch them from bullets forward to bullets facing to the rear. However, when you order them with the versatile option of IWB and OWB you may not get as good of retention as you would if you ordered them dedicated to one method of carry. And, you can adjust the retention to suit your preference on how they draw. Modern Warrior Concealments kydex magazine carriers are excellent for concealed carry applications, church security/church safety teams, airsoft enthusiasts, or for those on zombie response teams (ZRT). The ABS belt clips are very strong and will not break. Be sure to choose the correct belt loop size when ordering. 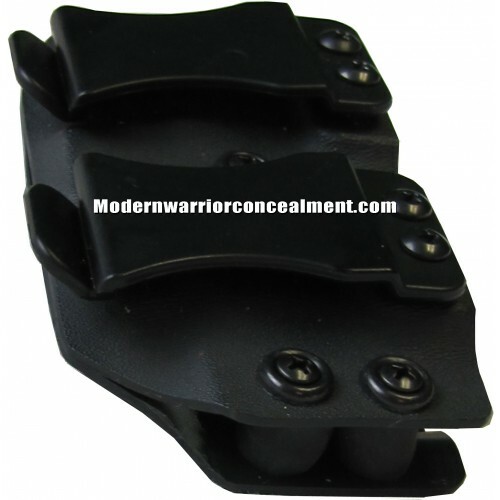 We offer kydex magazine carriers for the S&W SW99, 4006 TSW, S&W Sigma S&W9V, S&W M&P Bodyguard, S&W M&P 40, S&W M&P Shield, S&W M&P Pro 9mm, S&W M&P Pro 40, S&W M&P 45, S&W M&P 45 Compact, S&W M&P 9mm Compact, S&W M&P 40 Compact, 442, S&W M&P 642, S&W M&P SD9VE. Be sure to check the dropdown list for a complete listing. Lead times are typically 7-10 business days.